Abstract: A new approach to platencin, a potent antibiotic isolated from Streptomyces platensis, has been established. The highly congested tricyclic core of the natural product was successfully constructed by decarboxylative radical cyclization of an alkynyl silyl ester with Pb(OAc)4 in the presence of pyridine in refluxing 1,4-dioxane. The key decarboxylation, which likely takes place via lead(IV) esterification followed by carbon-centered radical generation and subsequent capture of the radical with a triple bond, allows the rapid construction of the twisted polycyclic system. Abstract: A four-step regioselective synthesis of multisubstituted isoquinoline derivatives from 3-bromopyridines was developed by the Diels–Alder (DA) reactions of 2-silyl-3,4-pyridynes with furans, followed by functional-group transformations. In particular, the silyl group at the C2-position of the 3,4-pyridynes played two important roles: firstly, it functioned as the directing group for the DA reaction, and secondly, it served to introduce diverse substituents at the C1-position of the isoquinolines by electrophilic ipso-substitution. Abstract: A liposomal drug delivery system was previously applied to ischemic brain model rats for the treatment of brain ischemia, and we observed that 100-nm-sized liposomes could extravasate and accumulate in the ischemic brain region even when cerebral blood flow was markedly reduced in permanent middle cerebral artery occlusion (p-MCAO) model rats. In the present study, we investigated the real-time cerebral distribution of polyethylene glycol (PEG)-modified liposomes (PEG-liposomes) labeled with 1-[18F]fluoro-3,6-dioxatetracosane in p-MCAO rats by positron emission tomography (PET). [18F]-Labeled PEG-liposomes were intravenously injected into p-MCAO rats 1 h after the onset of occlusion, and then a PET scan was performed for 2 h. The PET scan showed that the signal intensity of [18F] gradually increased in the ischemic region despite the drastic reduction in cerebral perfusion, suggesting that PEG-liposomes had accumulated in and around the ischemic region. Therefore, drug delivery to the ischemic region by use of liposomes would be possible under ischemic conditions, and a liposomal drug delivery system could be a promising strategy for protecting the ischemic brain from damage before recovery from ischemia. Abstract: This review focusses on the dynamic kinetic resolution (DKR) of racemic allylic alcohols to produce allylic esters in high chemical and optical yields, which was achieved by combining the hydrolase-catalyzed kinetic resolution and in-situ racemization of the remaining less reactive enantiomers. Two classes of racemization catalysts, e.g., Ru complexes and oxovanadium compounds, are mainly discussed. Typical examples of DKR are shown along with their application in the fewer-step syntheses of optically active compounds as valuable synthetic intermediates. The domino process integrating DKR with the active use of the installed acyl moiety for subsequent intramolecular cyclization is also discussed, which has great potential for the asymmetric syntheses of optically active fused cyclic molecules possessing multiple stereogenic centers. Abstract: A facile enantiospecific approach to (+)-ligudentatol (1) and (−)-ligudentatol (ent-1) is reported. The approach features the construction of a trisubstituted phenolic motif fused to a chiral aliphatic ring by a sequence of visible-light-mediated radical seleno transfer cyclization, bromination, concomitant selenoxide elimination–dehydrobromination, and demethoxycarbonylation, namely, a programmed aromatization. Biological evaluation of the enantiomers of ligudentatol obtained by the present route revealed for the first time their cytotoxicity towards various cancer cell lines. Abstract: Free radicals, which in the past were considered unruly chemical species, have become manageable and indispensable for synthetic organic chemistry. 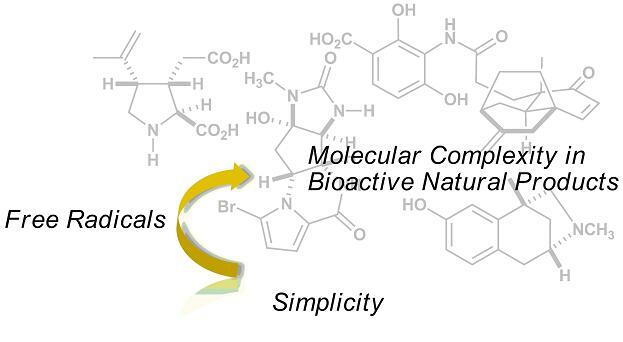 The unique nature of free radicals has allowed practitioners in organic synthesis to design flexible approaches to produce various materials ranging from small molecules to polymers. The present Personal Account describes the author's endeavors to create molecular complexity by the strategic use of free radicals, with an emphasis on the synthesis of bioactive natural products. Copyright © 2016 Laboratory of Synthetic Medicinal Chemistry Graduate School of Pharmaceutical Sciences, Osaka University . All Rights Reserved.